Holley’s LS Fest (link is external) is an event near and dear to our hearts. We attend every year for a chance to witness drag racing, autocross and drifting, all in one weekend and all cars featuring an LS or LT engine. This is where Dirk Stratton comes into the picture. Two years ago, at the 2015 Holley LS Fest, we saw a grey C6 Corvette ripping through the gears at Beech Bend Raceway with a trail of white smoke behind it and we were blown away. It was refreshing to see a Chevrolet chassis dominating in a motorsport series comprised almost solely of small Japanese cars, so we have been keeping our eyes on the driver, Dirk Stratton, ever since. As it turns out, he has grown leaps and bounds since we last saw him at LS Fest. That year, in 2015, he won the Midwest Drift Union Championship which earned him a spot in the Formula Drift Pro2 series, only one tier below the big dogs of Pro1. He competed in the ‘16 season of Formula Drift (FD) and came in a very impressive 4th place in the overall series points which earned him the prestigious “Rookie of the Year” title. Dirk is now positioned to compete in the FD Pro2 series again in 2017, although his “Rookie of the Year” title did earn him a license to compete in Pro1. “You know, I just think my team and I should compete another year in Pro2 in order to refine a few things and continue to grow. We hope to enter the Pro1 series in 2018 as a better team and I’m confident we can dominate,” Dirk told us. 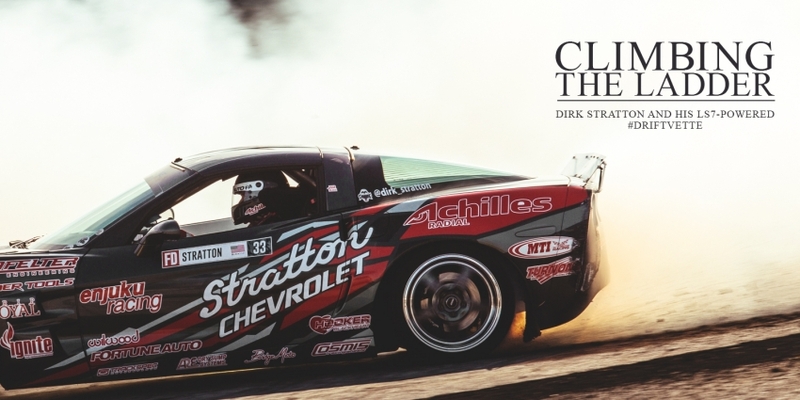 So, within a matter of just a few years, Dirk climbed the ladder from the grassroots level of drifting to a professional level, competing alongside some of the best drifters in the world. We were intrigued to find out how he got here and how he progressed so quickly, so we gave him a call to learn more about his story.